I have a brand new three-pack of short stories available for .99 cents on the Kindle and Nook today. This one is called "The Whiskey Doctor and other stories about the new Great Depression". 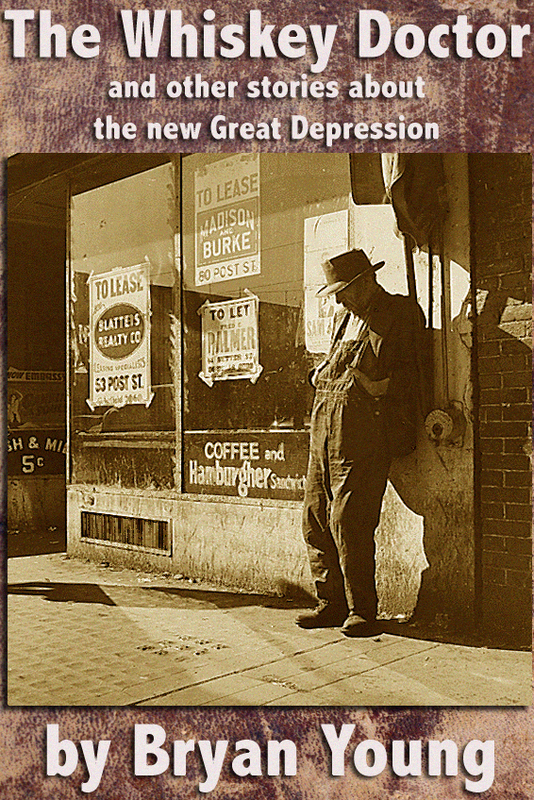 Some of my favorite art and stories grew out of the plight of the “working class” and those affected by the Great Depression. From Steinbeck’s Grapes of Wrath to every Three Stooges short and Charlie Chaplin’s Modern Times and a hundred other examples, in that era there was an overwhelming amount of art in the popular culture that brought attention to the horrible things going on in the country because of its economic realities. We’re living in a very similar period, but I haven’t seen the art reflecting the times. Every show seems to be about highlighting what it’s like to be rich, and our shows, movies, and magazines adore those who have everything but work for nothing. I’m not arrogant enough to think I’m the only one writing about these sorts of things, but I wanted to do it so that we don’t lose empathy for those struggling in our country. I’ve been accused of being “hyper-empathetic” and perhaps that’s true. Maybe I’m just overly idealistic. In either case, all I want to do is remind readers that maybe they don’t have it so bad and illustrate to them how bad things are out there. Whatever your feelings, at the end of the day, I hope you enjoy these stories and possibly learn something. You can grab all three stories for the Kindle and the Nook for just .99 cents. I enjoyed your site a lot! I am an aspiring writer as well. I recently started a site for commercial collaborative writing, called www.volpen.com. If you like it, please use it!